The presentation was designed to tell the Board what the school administration communicates to its employees about compensation. It also gave the public an insight into salaries and total compensation packages of teachers. Charping used as an example an employee with a master’s degree and 15 years of professional experience. Such an employee would receive a salary of $60,296 but total benefits of $85,815, Charping reported. 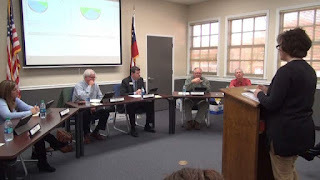 Charping used the example of a teacher with a master’s degree and 15 years of experience–called Jane Smith in the example given the Board–to show members what has been communicated to the system’s employees. She said the Total Benefits Statements had been mailed to all employees on Feb. 28. In the example, Jane Smith spent $10,909 annually of her own money for a benefits package that included life insurance, life insurance for a child, a family vision plan, state medical insurance, and contributions to both the state retirement system and a 403(b) retirement plan. Neither Jane Smith nor the school system made a contribution to Social Security, with the state retirement plan serving as the allowed alternative. Smith put $3,780 of her own money into the state retirement plan, and the Oconee County School System contributed $10,591. Smith also contributed $2,713 to her 403(b) plan, and the School System matched that contribution. The largest expenditure by the School System other than for salary for Smith was for the state health insurance plan. The School System contributed $11,340 to that plan, and Smith contributed $3,443. In addition, both Smith and the School System paid $874 in Medicare Tax. The Total Benefits Statement that Charping presented to the Board at its regular meeting on March 12 for Smith showed that she contributed $11,783 in insurance, retirement and taxes, and the School System contributed the $85,815.53, for a total expenditure of $97,599. The School System’s contribution was 87.9 percent of the total expenditure of $97,599. Charping did not compare the benefits package for Oconee County school employees with those of other school systems in the state. The The Atlanta Journal Constitution used data obtained from the Georgia Department of Education for the 2015-2016 school year to make such a comparison. The paper used the Certified Personnel Index that school districts send to the Georgia Department of education each year. The index includes all local supplements, including bonuses. In that comparison, the average teacher in Oconee County Schools received a salary of $57,160, which was higher than for any of the school systems in the counties surrounding Oconee County except one. Walton County’s average teacher pay in that comparison was $60,023, the fourth highest in the state. The video below is of the entire regular meeting of the Oconee County Board of Education on March 12. Charping made her report on the Total Benefits Statement at 14:32 in the video. OCO: BOE 3 12 18 from Lee Becker on Vimeo. While I understand this article references the total compensation for teachers, I have a question concerning administrators. When an administrator drives an OCS vehicle home daily as well as weekends, breaks and during the summer is this considered part of their total compensation and is it appropriately reported to the IRS and SSA? Also, would it not be more cost effective to pay this individual mileage for use of their personal vehicle should they be called in outside of regular working hours? It would be nice to get a response on this from the individuals running for re-election as well as their opponents. And yes, I am posting this anonymously because if you dare question the school system in Oconee County you will be run out of the county on a rail. The school system is out of control. However, current candidates will lot make it better. We should’ve never built a second high school. Now we are building schools on a faster rate then counties with twice our population. Go figure. What Saranna fails to explain in the figures are all the hours teachers spend after work, nights, weekends etc..off the clock grading, planning, calling parents and such. There's no compensation for teachers who supply children with pencil, paper and the likes. With the current batch of parents there is even little gratitude given when teachers go above and beyond. Instead they just ask for more from the already stressed out teachers. If the system, parents and students keep treating these hard working people the way they do we'll be paying six figure salaries just to have someone in the classrooms. There is nothing like a bureaucrat trying their best to present a convincing "Gilded Turd" analogy to anyone who will listen. A whole bunch of numbers was presented for a reason which is unclear. Is this bragging, attraction and promotion, or an explanation of huge salary numbers county-wide. Next should be a presentation of the Administration packages, even if it may be difficult to believe that each and every perk is honestly revealed. There is no doubt that Walton County pays more for teachers to suffer over there.